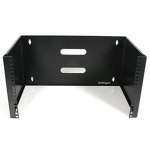 The RK1219WALLOH 12U 22in Depth Hinged Open Frame Wall Mount Server Rack lets you wall mount your (19-inch wide) servers, A/V or network equipment and features a hinged rack design that allows the entire frame to swing open for easy installation and maintenance of your equipment. The 12U wallmount rack offers a 4 post design for additional support of your equipment, storing a maximum weight capacity of 63 kg (140 lbs). 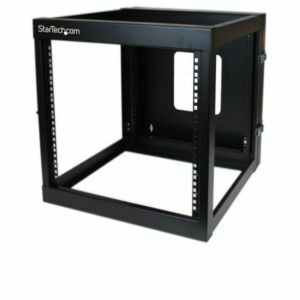 Constructed of high-quality SPCC cold-rolled steel for strength and durability, the open frame wallmount server rack allows for maximum airflow, and ships complete with all of the rack screws and cage nuts required to mount your equipment, saving the expense of purchasing them separately. Backed by a StarTech.com Lifetime warranty.